Product #60584 | SKU BMHDEX | 0.0 (no ratings yet) Thanks for your rating! A deposit of $750.00 is required for this pre-order. The HyperDeck Extreme 8K HDR features the trusted reliability of HyperDeck combined with new innovations such as space saving H.265 files, optional internal cache, 3D LUTs, native 8K and HDR support. With the ability to record native 8K in H.265, customers get reduced storage costs and amazing image quality. The large touch screen ensures a perfect view of their recording as well as control over all deck settings. Customers can then add HyperDeck Extreme Control to transform it into a traditional broadcast deck. This means HyperDeck Extreme 8K HDR is the perfect solution for the next generation of broadcast, live production and digital signage. HyperDeck Extreme 8K HDR has an innovative touch screen user interface with deck controls as well as a large screen to view their recording. Then add a HyperDeck Extreme Control for traditional broadcast deck controls and a large shuttle knob that feels incredibly luxurious to use. Customers can even rack mount the HyperDeck and the controller. 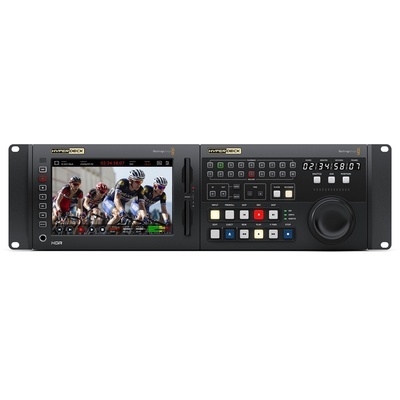 HyperDeck Extreme 8K HDR also includes 2 media slots, Quad 12G-SDI for 8K, analog connections for archiving, USB-C external disk recording, plus a front panel speaker and headphone jack. There's also an optional cache that eliminates dropped frames if their media becomes full or is too slow. Both AC and DC power connections are also included for studio or on location use. It is also great for live production as a master recorder, clip player and for recording ISO cameras. The analog inputs allow customers to record from old video tapes, so legacy programming can be used on the latest streaming services or for use in editing. Digital signage in 8K is easy with HyperDeck Extreme 8K HDR as it has 10G Ethernet for fast media uploads, plus it features a simple remote control protocol. Customers can even use it as a field recorder as it includes HDMI, SDI and analog inputs with built in scopes and 3D LUTs. The scopes also help customers QA masters to ensure compliance with broadcast standards before streaming and broadcast.